This Procurement Proposal Page is offered through the Finance Department and is a part of the Sac and Fox Tribe of the Mississippi in Iowa. 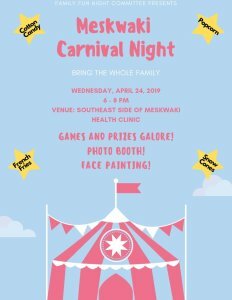 Contact the Finance Department at (641) 484-4678 for additional information. 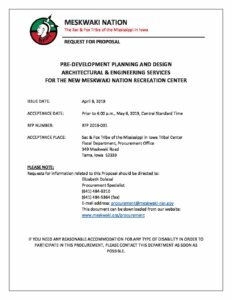 This is the Meskwaki Nation’s request for procurement proposal page. These files are available to any vendor interested in providing the commodity and/or services listed in the specification. The Sac and Fox Tribe of the Mississippi in Iowa reserves the right to post or not post any or all bid opportunities to this site. Contractors: Visit our Contractor Terms and Conditions page. It is the responsibility of the person/business downloading the request for proposal specifications to notify us of interest by submitting proposal. It is also the responsibility of all submitters to verify and submit all addenda with us (attachments which may include, licensure, bonding, etc. – check the specifications for proposal before submitting) prior to the proposal closing date.